An important part of Labrador Retriever dental health is learning how to correctly brush your dogs teeth. Over 80% of dogs show some signs of gum disease by age 3 if not properly cared for. Bacteria in the mouth can result in dog dental problems such as plaque, calculus build-up (tarter) and gum disease. If bacteria enters the body through the mouth, problems can take place in internal organs. Other problems such as cavities are rare in dogs. 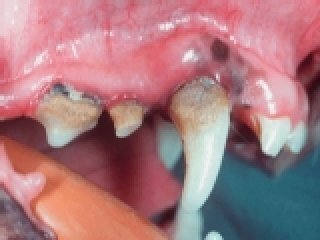 The bigger canine dental problem are dental tooth fractures. If the inner part of a dog tooth in exposed (the pulp) a dog dental root canal is needed. Like people, dogs may also need a bridge or a crown. 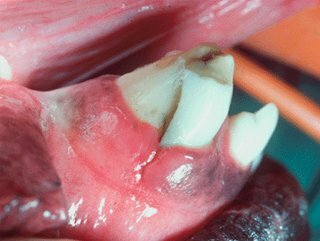 Dog tooth dental fractures are common. They need to be treated when the inner part of the tooth becomes exposed. Source: UC Dave School of Veterinary Medicine Chew toys and dried food will help to keep your dogs teeth healthy but from a year old or so brushing the teeth will help prevent plaque build up and problems with the gums. Avoid any foods that will stick to the teeth or that are soft. There is lots of different doggie toothpaste on the market today so don’t be tempted to use human toothpaste as this will be harmful to your Lab and may not lead good to your Labrador Retriever Dental Health. Toothbrushes are also available though many owners prefer to use the finger brushes which simply slip over the end of the owners finger. For the first few sessions it is wise not to use any kind of brush. Put a dab of toothpaste onto your finger and let your Lab taste it so she knows it isn’t unpleasant. Stroke the outside of the dogs cheek and simply repeat the procedure a few times before moving onto the next stage. The next stage in your Labrador Retriever dental health routine is to introduce the toothbrush itself. After putting a small amount of toothpaste onto the brush (or finger brush) gently brush a couple of teeth and the gums. Use the brush in a circular manner but to begin with only worry about brushing a couple of teeth – the aim of the exercise is to let the dog become used to the brush. Gradually increase the number of teeth brushed paying more attention to the outside of the teeth and the gums. When you are brushing all the teeth the routine shouldn’t take more than a minute. Try to make sure the tooth brushing always happens at the same time and make the experience fun for your dog and there won’t be any problems. One thing to pay attention too during your labrador retriever dental health sessions is to make sure that the rear teeth are thoroughly cleaned. With Labs it is the back teeth which attract most plaque so the owner should take special care when cleaning them. Most dogs should react well to their regular tooth brushing as long as you make it fun and, of course, make a big fuss of your Lab when he sits quietly and behaves himself when having his teeth brushed. Your veterinarian should be checking your dog's teeth at every annual visit. Before treating the teeth a Vet will use general anesthesia to keep the dog still. Modern anesthesia poses no risk to the pet and greatly outweighs the risk of canine dental disease. The Vet will remove any tartar buildup (must be done by a Doctor) and can include ultrasonic scaling and manual subgingival scaling. This will be followed by polishing.